NICE AND EASY: What model of DIRECTV box do I have? A lot of times it does actually matter what model receiver or client box you have. If you are looking for specific accessories, there are some that only work with some models. When you’re shopping, it’s best to know what you have at home. If you have a non-Genie receiver, it could look a little different but the information is the same. The most important part is where it says “Client,” “Model,” or “Receiver.” That would be the very first line on the left. It matters a lot when you’re choosing a remote. 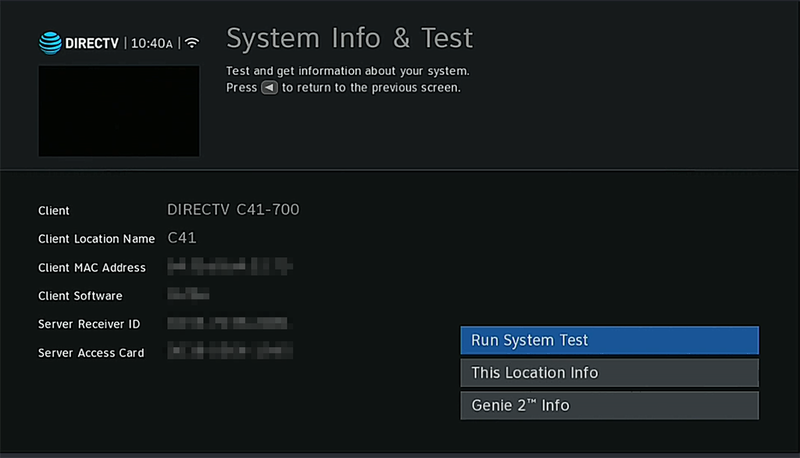 All DIRECTV boxes made since 2003 will use any DIRECTV remote, but some will be able to take advantage of “RF mode” which lets you aim through walls and doors and lets the receiver sit behind the TV. Another case where it matters is with newer, smaller hardware that requires special cables to work with a very old TV. There are plenty of times when this information is needed. If you can’t turn on the receiver, look for a green sticker. It’s usually on the bottom or if your receiver has a spring-loaded door in front, it can be behind that. When you see it, you’ll see the model number there. You can also find the model number in the “My Equipment” section at DIRECTV.com.